If you tend to think squid belongs in bait shops rather than kitchens, you might reconsider. Calamari, another name for squid, is a good choice for your healthy lifestyle, whether you're interested in losing weight or just making sure you give your body the nutrients it needs. Plain, uncooked calamari is exceptionally low in calories and fat. Sushi squid, without any additives, has a mere 26 calories per ounce, and less than half a gram of fat. However, if you don't fancy raw calamari, be careful about cooking methods. Calamari is often served fried, which makes it significantly less healthy. A 1 cup serving of breaded, deep-fried squid has 205 calories and 15 percent of the daily value for fat. Calamari is a good source of protien. 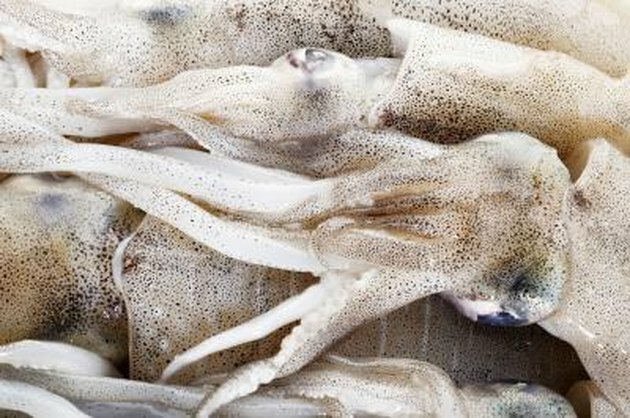 An ounce of plain squid offers 4.4 grams of protein, or about 9 percent of the daily value. Protein is well known for its role in building healthy muscles, but is also important to dieters because it helps keep your appetite under control. The body processes protein slowly, helping you stay full, according to the book "The End of Overeating: Taking Control of the Insatiable American Appetite." Calamari provides essential vitamins and minerals. A mere 1 ounce provides 9 percent of the daily value for calcium, 6.1 percent of the daily value for vitamin B12, 2.8 percent of the daily value for zinc, and 2 percent of the daily value for vitamin C. The Epicurious Food Dictionary also reports squid is a good source of phosphorus. In recent years, government agencies such as the Environmental Protection Agency have expressed concern over the rising mercury content in fish and seafood. Mercury gets into the oceans as the result of pollution. However, not all fish and seafood are the same when it comes to mercury. The EPA reports that squid is one of the best fish to eat, since it tends to contain very low amounts of mercury.